Beauty & All That: Coterie.com for Beauty Deals! Coterie has launched! They're the latest deals site that specializes on my favorite kind of products- beauty! 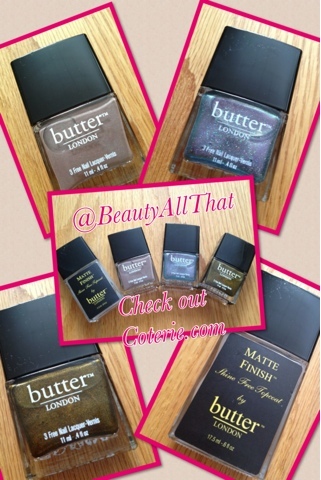 Launched last week, they're offering specials on brands such as ButterLondon, Kevyn Aucoin, and MOR. Thanks to iFabbo.com, I got a sneak preview of their site and the opportunity to receive a sample set of three ButterLondon nail lacquers and a matte finish topcoat polish. Their shipping was quick via FedEx and got my polishes wrapped securely in bubble wrap.The current MOR event is selling their body scrub & body lotion duo in different scents, such as Basil & Grape, Neroli Clementine and Black Currant Iris. They are also selling Kevyn Aucoin, where you can purchase their three or six-piece eye kits featuring their best-selling products. Although right now, their products are few, they seem to have some gems that I am looking forward to monitoring. Some upcoming brands include Stila and PerriconeMD, so can't wait to see what Coterie will offer!